You can catch a glimpse of the lookout tower in Blatenský hill during your travels through the Ore Mountains about 2 km far from Horní Blatná. 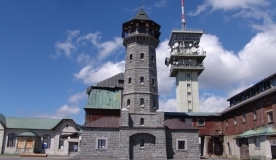 The lookout tower lies at the route of two popular nature trails “Vlčí jámy” (Wolf Pits) and “Blatenský příkop” (Blatná Water Ditch). We highly recommend you to make a stop here and climb to the lookout tower. 21 meters high stone tower was built in 1913 owing to the initiative of the Society for winter sports from Horní Blatná. The lookout tower belonged to a hotel and along with it was supposed to support the development of tourism in this part of the Ore Mountains. Hotel with the tower served its purpose until the 40s, when a military area was created here. Due to the state of decay, the hotel had to be destroyed a few years later. The lookout tower was preserved because of the care of the Czech Union for Nature Conservation (ČSOP) members. During the school holidays (July and August), the lookout tower is open daily from 9 am till 5 pm, at the same times at weekends outside the summer season. If you climb the 85 stairs up the tower, you will be rewarded by a breathtaking view of the Ore Mountains from a height of 1,044 meters above sea level.